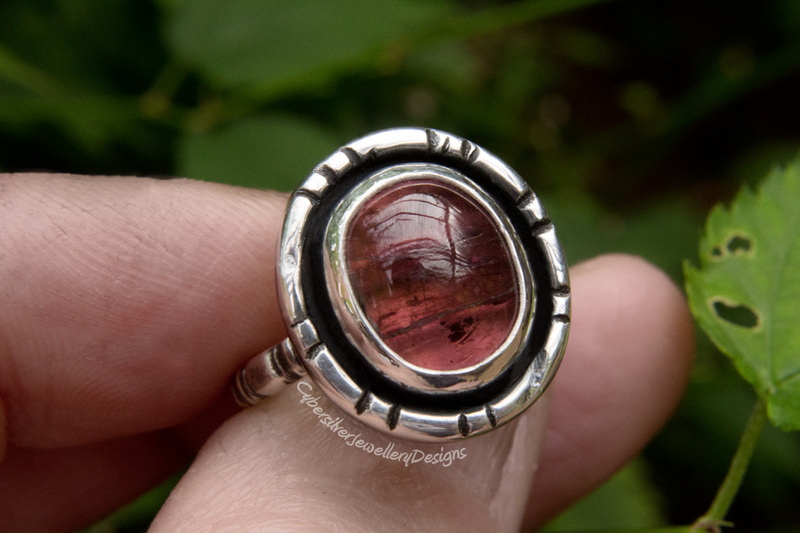 A lovely deep pink tourmaline with natural inclusions set in a unique handmade silver setting. This stone reminds me of the stunning striations in a dramatic sunset. The detailed pattern on the band is hand created and is echoed in the thick silver circle around the stone. The silver has been oxidised, polished and waxed with a microcrystalline wax to highlight the details and help protect the oxidised surface. Oxidisation is a surface treatment that can continue to lighten with wear. A lovely substantial silver ring. Tourmaline is believed to strengthen the body and spirit, especially the nervous system, blood, and lymph system. It is also thought to inspire creativity and has been used extensively as a talisman by artists and writers throughout history. 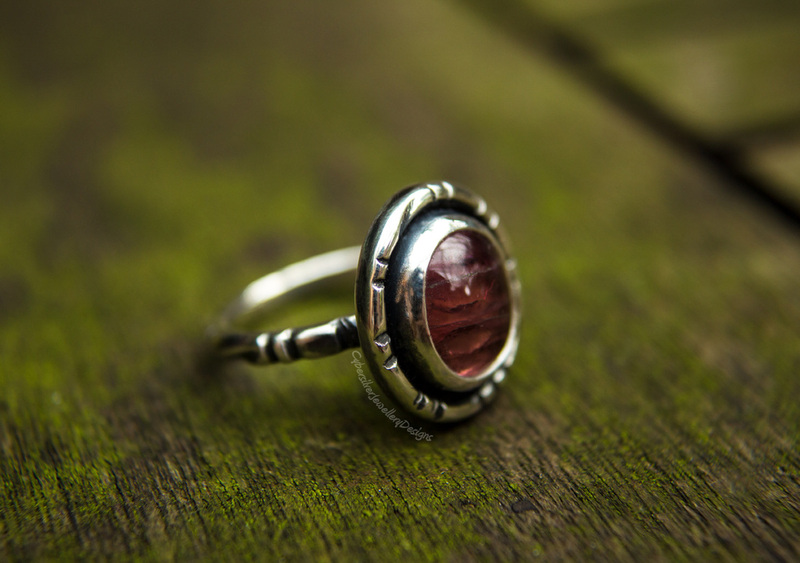 Pink Tourmaline can vary from pale pink to deep red, and is associated with love and matters of the heart. 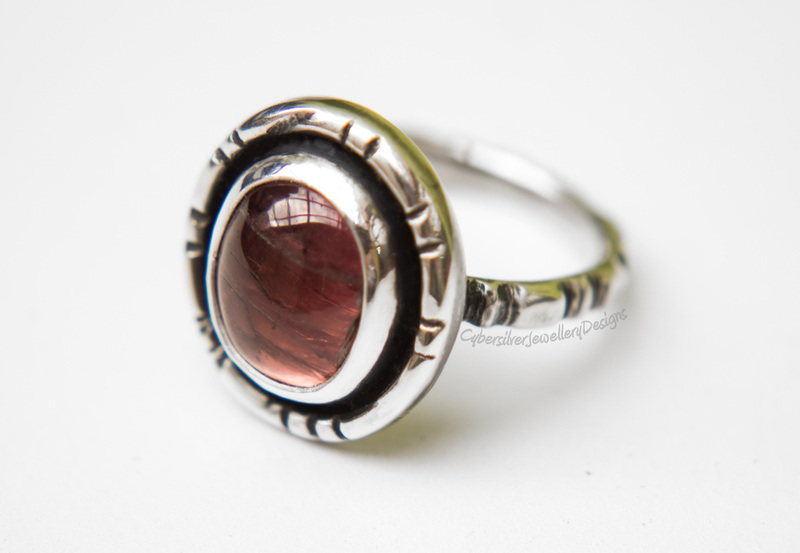 It represents the feminine or yin energies and is unsurpassed as a gemstone in healing old emotional wounds. The stone also helps stimulate feelings of joy, happiness, love and relaxation and is one of the most powerful stones in helping to bring calm and relieve stress in your life. Your ring will be dispatched within 5 working days - if you require it sooner please message me. ​Royal Mail will not insure precious jewellery sent any other way. This is a next-day, tracked, insured and signed-for service. International orders are sent International Tracked and Signed For. I will send you your unique tracking number as soon as I have posted. Please refer to our RING SIZING GUIDE and TERMS AND CONDITIONS before placing your order.